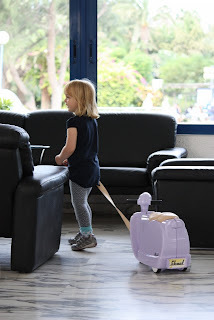 As you may know, last week the Mellow household had a very mellow holiday in the Canaries and Lara loved parading through the ariports on her brand new suitcase of her very own - the Skoot ride-on suitcase by Worlds Apart. The Skoot ride-on is part luggage, part retro scooter! it comes in red, blue, pink and lilac and really does look like a mini motor scooter. There is absolutely no doubt that Lara was turning heads as she shuffled through Gatwick airport from both adults and children alike. 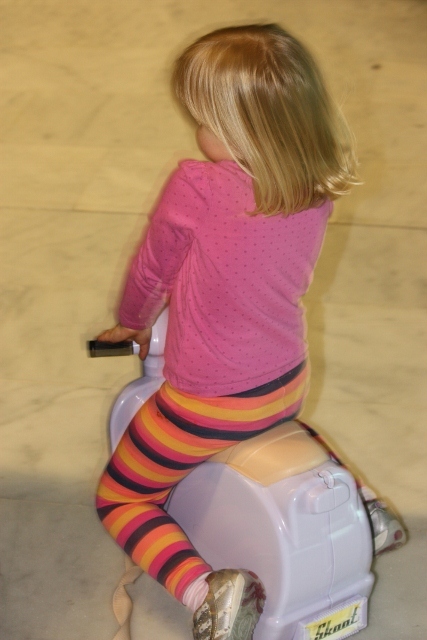 The Skoot, much like the rival Trunki, is specifically designed for children and can be used as hand-baggage. The handle bars are easily detachable for when you want to stow it in an overhead locker on the plane. 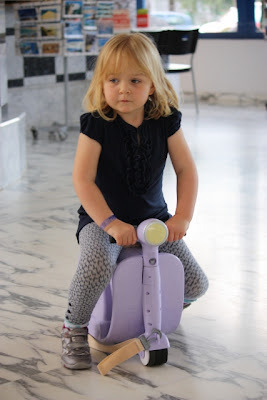 Lara really enjoyed riding it although I would say, that at 3.5 years old and towards the lower age range for the product, Lara does seem to be a bit enormous on it and I think that by 6 years old she would be struggling to move herself around on it. Although Lara enjoyed using her Skoot, and felt very grown up with it, I have my reservations and feel that it is a little bit like style over substance. Two secure clips to ensure the luggage won't come open or be too easily opened by your little ones when it is inappropriate! Carry strap which clips on to allow you to pull your child along or carry the suitcase on your shoulder when your child gets bored/tired or when you are in a hurry. It looks really groovy - I suspect it is more appealing to grown-ups than kids! The internal luggage space is actually quite small. We put in snacks, a teddy bear, headphones and games but couldn't fit in a picture book into the space inside. 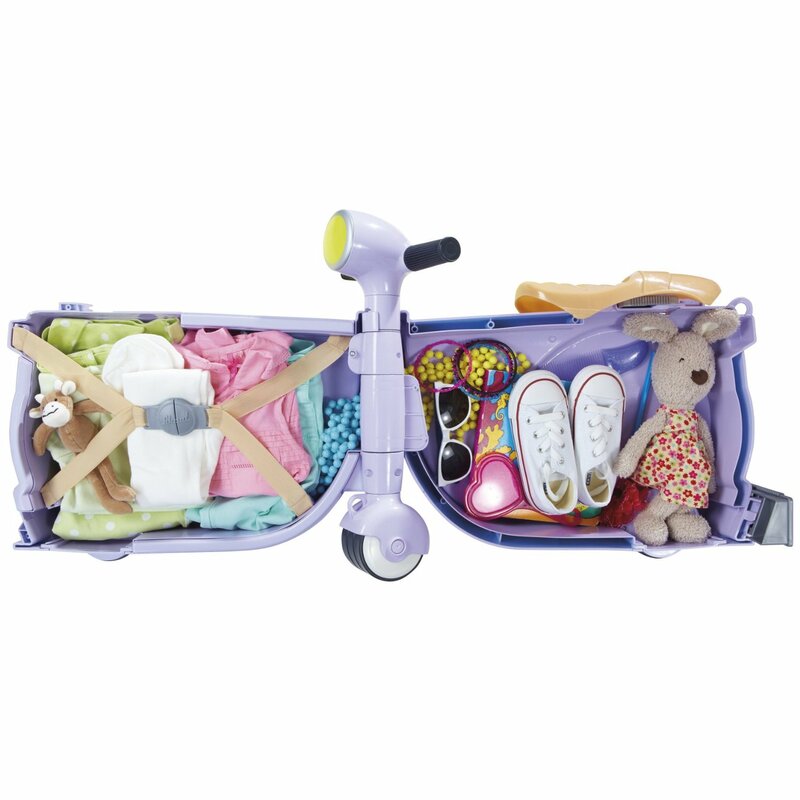 The handle-bars allow your child to steer which sounds brilliant but is actually blimming annoying because when you are trying to pull the suitcase behind you, the handlebars have to be pointing exactly forwards or else it goes astray. The suitcase gaped at the sides if it was heavily loaded and was hard to close and open. There is not much growing space for Lara. The clips on the strap regularly unclipped themselves and inverted the clip when you tried to carry it as a shoulder-strap. This is particularly stressful when you have a queue of stressed passengers waiting behind you while you struggle to clip it back together.